I Had A Little Husband freezes the moment when this artist imagines coding the page interactive. My collection of antique nursery rhyme books is a source of inspiration. “Jolly Jingles from Mother Goose”, published by M. Donohue and Co. is over 110 years old. The rhymes within are, of course, much older. The pages crumble as I turn them, and leave scraps of browning paper on the scanner bed. If you put a body of text into an array, line-by-line, you can do lots of interesting things with it. 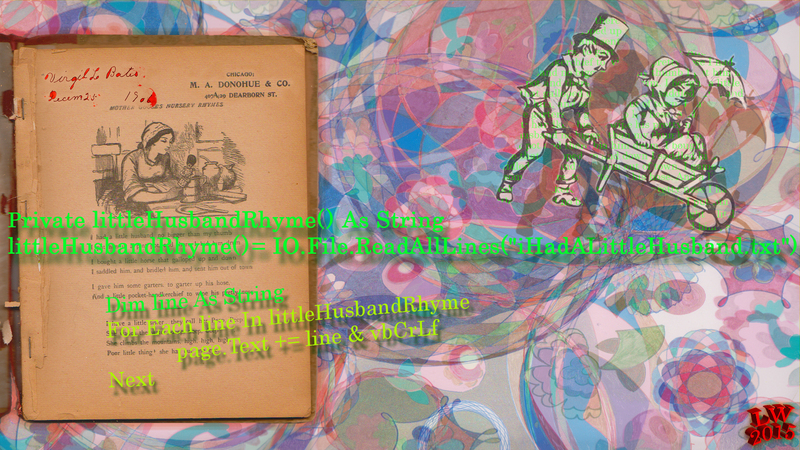 You can make every character of every word of a rhyme (or a whole collection of rhymes) do something. You can make words take action. When is a rhyme a magic spell? When is it a discussion on the balance of power between wife and husband? When is it just a rhyme, precious, hidden in an old book?